Every once in awhile, when you’re engrossed in a good book series, you find yourself looking forward to seeing your old friends each time they appear in a new novel. Such was the case with the Dalton Fury books, featuring Kolt “Racer” Raynor. I eagerly anticipated each volume in the Racer series as it appeared on the “New Releases” shelf at the Lockport Library. When I first found Execute Authority on the shelf, I was excited there was another book. Then I read the forward to the book. 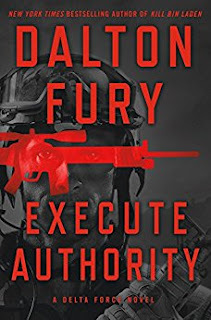 Dalton Fury is a pseudonym for a senior ranking military officer who was involved with the operation to hunt and kill Osama Bin Laden. His workings as a Delta commander gave him unique insights into the characters and plots he would devise for his novels. Unfortunately, the man behind the Dalton Fury moniker passed away in the fall of 2016, just as he finished up this latest novel. Racer and his group are in Greece acting as a protective detail for the President of the United States as he visits the Mediterranean country. Under his watch, the Greek prime minister is killed by a sniper assassin. Racer, identifies the killer through tell-tale signs, and realizes it is someone from his past. When it appears that the sniper has died in an explosion, everyone breathes a sigh of relief...except Racer. He thinks the man is still alive after an elaborate death hoax. Political forces behind the scenes of the Washington power lords seem to have a vendetta against Racer and will stop at nothing to tarnish his name and have his employment terminated. After he is proven right, begrudging support comes his way, but with the understanding that his days of doing whatever he likes are over. Fury’s works have been intriguing reads over the past few years. His insights lends a realism to the narrative, making the reader even wonder if these exploits were pulled directly from his time in the Delta Force. Each novel flows effortlessly into the next, providing a main plot over five books that are supplemented by subplots that make up each volume of the series. While reading this book, I watched as member after member of Racer’s team dropped to the wayside. Fury knew this would be his last book, and was likely trying to ensure that the series would not continue after he was gone. There is a certain finality to this book take lets the reader know this is the end. Despite that, at the very end an opening is left where perhaps someday, another writer can pick up Racer’s story and continue. We’ve seen that happen with Tom Clancy, Vince Flynn, and Robert Ludlum. However, if they mantle is once again picked up, I sincerely hope that the author is someone who knows the workings of a force like Delta so that the intensity and truthfulness of Fury’s stories can continue on at the same, high level. Ultimately, while I would love for these stories to continue, it may be better off to just allow Kolt Raynor to ride off into the sunset. The books are just too good to be carried on without the original author. If you get a chance to read any books of this series, I highly suggest it. They are very well written and highly charged with action and adventure. I will sorely miss the works of Dalton Fury, whoever he really was. They were almost as good as watching a movie. Heck, maybe they were better than watching in a movie. Craig Bacon loves books series. He eagerly anticipates the next volume each time he finds a series he likes.